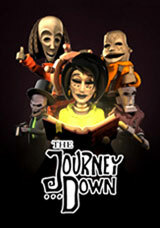 The Journey Down is a three part graphic adventure game presented in high definition. Chapter One is a commercial remake of a low-resolution free adventure game called called The Journey Down: Over the Edge. Chapter Two and Three are the commercial follow-ups to the story. Bwana and Kito help a young woman find a book that contains the secret to reaching "the Underland". Bwana, Kito, and Lina journey to the gloomy, mist shrouded town of Port Artue. Bwana, Kito, and Lina finally make it to the mysterious area beneath Port Artue known as "the Underland".